CarGurus has 4,821 nationwide 7 Series listings starting at $2,190. You will be more than comfortable driving or riding in a 2014 BMW 7 Series, but BMW is not comfortable leaving well enough alone when it comes to its flagship luxury sedan. After adding new engines and reshaping the exterior last year, BMW enhances the 7 Series' technology this year, delivering a premium sedan that is opulent but not over-the-top and rivals any in its class. It's hard to complain about a vehicle like this one, but one constant criticism in recent years is that the iDrive system, which controls all the infotainment features, is difficult. BMW has heard the complaints and has tweaked the system regularly, and this year is no exception. The iDrive now comes with a touchpad controller, a revamped menu system, revised navigation displays and more voice control. The navigation system, which is standard in all 7 Series trims, has also been upgraded with a 1.3GHz processor and a dedicated 3D graphics card. The new technology extends beyond the cabin for the 2014 7 Series. The power trunklid can now be opened and closed by running a foot underneath the rear bumper, a convenient feature when your arms are loaded with shopping bags or luggage. The primary difference between the three 7 Series trim levels lies under the hood. The 740i and 740Li (long wheelbase) are powered by a 3-liter turbocharged inline 6-cylinder that was introduced last year, produces 315 hp and 300 lb-ft of torque, and gets 19 mpg city/29 highway with rear-wheel drive (RWD) and 19/28 with all-wheel drive (AWD), a.k.a. xDrive in BMW parlance. The 750i and 750Li come with an engine that made its debut last year, a 4.4-liter twin-turbocharged V8 that generates 445 hp and 480 lb-ft of torque, and averages 17/25 with RWD and 16/24 with AWD. The 760Li (there is no 760i) is powered by a 6-liter twin-turbocharged V12 that churns out 535 hp and 550 lb-ft of torque and gets 13/20 with rear-wheel drive (AWD is not available in the 760Li). All these engines are paired with an 8-speed automatic transmission. There's also a version of the 7 Series modified by Alpina, the independent company known for working with BMW on some of its vehicles. The Alpina B7, as it's known, is best distinguished from the other 7 Series trims by its engine, a retuned version of the 4.4-liter twin-turbo V8 that cranks out 540 hp and 538 lb-ft of torque. The B7 has a larger intercooler, a transmission cooler, and upgraded pistons, brakes, tires, and suspension. The standard transmission is an 8-speed automatic with overdrive and Alpina Switch-Tronic sequential shift control. You can get a B7 with either a short or long wheelbase, and it features a few additional interior and exterior highlights. All 7 Series trims come with Driving Dynamics Control, a system that is connected with the steering, damping, throttle and transmission and allows the driver to switch between 5 settings for the feel that best suits their driving style and road conditions. All models also come with an air suspension and an available M Sport package that adds a body kit, 19- or 20-inch wheels, a sport steering wheel and Active Roll Stabilization. There's no doubt this car was built with the driver's pleasure in mind, but if you're going to spend more time in the back seat, the Li version and its extra 5.5 inches of legroom is the choice. The standard 7 Series equipment would qualify as luxurious options for most vehicles. The base features include 4-zone climate control, heated power front seats with memory, leather upholstery, heated leather steering wheel, adaptive headlights that swivel with the car, a 16-speaker audio system with 2 subwoofers, satellite radio, Bluetooth, heated mirrors, a sunroof and park assist with rear-view camera. Some notable options are a Bang & Olufsen sound system, full-color heads-up display (standard in the 760), active cruise control that automatically maintains the distance behind the car ahead, a rear-seat entertainment package that adds an iDrive controller and two 9.2-inch screens, and the Driver Assistance Package that comes with lane-departure alerts, blind-spot detection, pedestrian warning and side- and top-view cameras. Safety agencies haven't crash-tested the 7 Series (it's too pricey for that), but the consensus seems to be that this is an extremely safe car. All models come standard with traction control, stability control, brake assist, a full complement of airbags, active head restraints and Attention Assist, a system that monitors the driver's activity and displays a coffee-cup shaped warning if it senses fatigue. What's your take on the 2014 BMW 7 Series? Mariibel Outstanding vehicle. Better exterior than current series. Ultimate luxury and comfort. High end. Car stands out over other series and makes. Users ranked 2014 BMW 7 Series against other cars which they drove/owned. Each ranking was based on 9 categories. Here is the summary of top rankings. Have you driven a 2014 BMW 7 Series? Can You Filter The Car Search By Interior Color? 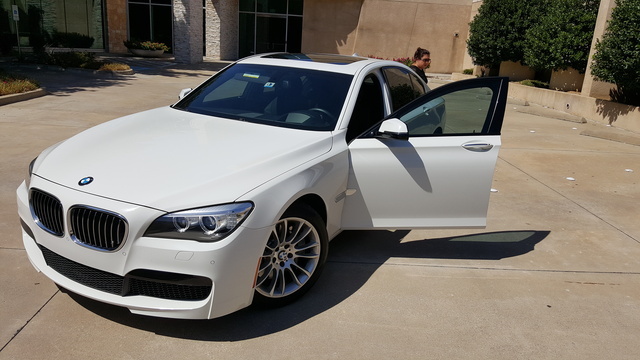 I am trying to find the perfect BMW and want it to be white on white. From what i understand white (not tan) interior is rare and I want to filter just on white interior. Is that possible? Hi there I have a problem with the passenger door in 730d model 2014. It won't close or open using remote control. All other doors working fine using remote control. I hope you could help. What's The Diference Between BMW 740 And 750 ? How can I search for only a BMW 7 series Alpina? You do north offer that option.